How’s it going pro contractors and DIY ninjas? 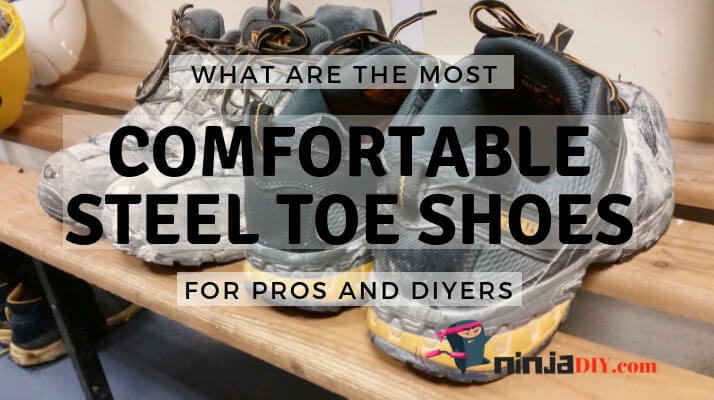 Wondering what the most comfortable steel toe shoes in the world are? Well, look no further. 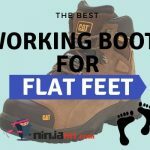 I have compiled a list of the top seven steel toe shoes any construction site worker or DIYer should consider. EXCELLENT shoe when it comes to comfort. No more pain! This shoe’s internal mechanism has been engineered to provide you amazing arch support. Plus, the asymmetrical steel toe cap on this shoe it’s a great feature. It will make sure your toes will have enough space to breathe and spread out for more comfort. Read reviews by clicking below! A couple of my friends recently brought up the topic and it was quite interesting to hear their personal experiences with steel toe shoes. More often than not, the trade-off involves sacrificing safety for comfort which at first doesn’t sound so bad, or does it? I’m a handyman (amongst other things 🙂 ) and considering how much time I spend on-site, I thought this article was well timed. Before I go on if you are a construction pro and instead of shoes, you need boots … here’s a great article I’ve put together about the best safety boots for contractors. Without much ado, let’s dive into the good stuff. If you’re standing a lot on your job, this safety shoe will make you really happy. As I’ve said above it has a great technology that will help you stay more comfortable during a long shift. Your toes will be safe since the shoe comes with a very awesome steel toe cap protection. It’s awesome because it’s spacious and allows you to move and flex your toes as you wish for more comfort. Click below and see what other HUNDREDS of users are saying about it! Closing off our top 7 most comfortable work shoes is the Keen Utility steel toes shoes; a one of a kind work shoes that delivers on comfort and safety. The shoes have a rugged yet functional look to them and the first thing that came to mind when I first saw these shoes was “man they look tough”. The shoes are made out of high-quality leather and breathable mesh that stands up to wear and abuse. The makers of this working shoe based the design on durable running shoes with a steel toe box and super strong rubber soles built into it for a start. The shoes internal support mechanisms are designed to provide arch support and follow your feet’s natural contours. This pair of work shoes is built for an active lifestyle; whether you’re into hiking, machine work, construction and so on. The shoes come with proprietary Cleansport NXT technology that provides protection from feet odor. The idea is based on the fact that you will likely spend a good deal of time in these babies. These Keen work shoes have asymmetrical steel toe boxes that protect your toes. The asymmetry varies from the left foot to the right foot and the shape covers the big toe to the small toe while maintaining a clean profile. The shoes are designed around running shoes so you can bet they are super comfortable to have on. The contour-hugging insole inserts make working and walking in these shoes a real pleasure. The tread pattern on these shoes makes it almost impossible to slip on any surface regardless of the liquids involved. The grip is simply out of this world which is probably the biggest selling point. The laces on these work shoes come loose too easily which makes tripping over and injuring yourself a real risk. ☛ Don’t forget to check out what more than 1000 customers have said about these safety shoes on Amazon. This won’t be a good fit if you’re doing dirtier, heavy outdoor jobs like construction. But it’s a great shoe from a TOP QUALITY brand that might serve perfect for you if you work in a construction site office. Or maybe you wear a suit and tie at your workplace but steal required to wear safety shoes. Check out what owners think about the quality of these Caterpillar shoes. Click below! The Caterpillar Men’s steel toe Oxford is built to meet the demanding safety and comfort needs of any construction site. The brand pays particular interest in anti-static buildup and discharge by maintaining high electrostatic resistance which helps protect you when working on live electrical circuits. Safety and comfort aside, this steel toe shoe model boasts a classic leather shoe finish that portrays a sharp business look or a casual one that doesn’t limit your ability to handle serious tasks at the worksite. As far as traction goes, these Caterpillar Men’s steel toe shoes feature a slip-resistant rubber sole that stands up to slippery surfaces of all kinds. Whether you’re working in wet or oily environments, you can rest easy knowing there’s no risk of slipping and injuring yourself at work. The craftsmanship on this pair of steel toe shoes is nothing short of exquisite. Not only can you rock these babies to work and stay super comfortable, but you can also show up to a formal function in them and look sharp as well. The steel toe box can stand up to impacts from falling items and heavy loads which would otherwise inflict crippling injuries. As is the industry standard, the steel toe box can withstand 200 joules of impact and 1000 kilograms of mass, quite decent if you ask me. Caterpillar took into consideration the electrostatic charge buildup known to cause injury upon discharge. They’ve included a charge dissipating midsole and a removable inner sock lining to keep you safe from those potential injuries. At 2 pounds, the steel toe shoes are heavy to move around in. This can be a problem for people who need to cover large distances back and forth. 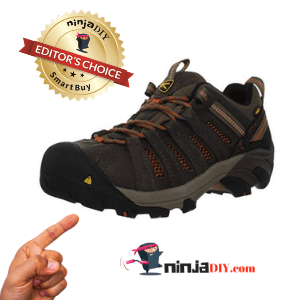 ☛ Don’t forget to check Reviews and Opinions about these safety shoes on Amazon. It looks AWESOME and it feels great to wear them! TONS of features. Like the medial and lateral webbing that offers you stability and a locked-in fit, while the memory tech footbed adapts to the unique contours of your foot. It will make feel like you’re not wearing anything 🙂 Gain access to other’s people opinions and reviews about this shoe over to Amazon. Click below! Reebok introduces a fresh new dynamic to the steel toe shoes with the sublite work RB4443. This pair of construction shoes blends the comfort and versatility of running shoes with the toughness of a steel toe shoe. One look at these things and you might actually mistake them for your run-of-the-mill trainers or running shoes fooled me too. Developed for accelerated performance, this pair of construction shoes features proprietary Footfuel technology. Footfuel comprises a memory foam footbed that changes according to the contours of your feet. It has been proven that the levels of comfort/discomfort you experience on your feet can have a direct impact on your productivity, health and overall stamina. This steel toe shoe is inspired by the continuous pursuit of fitness through an active lifestyle. This means the design is centered around providing the most comfortable experience possible while also doubling down on safety. Compared to a handful of other models, the Reebok Sublite work shoes are the lightest work shoes I have come across in a long while. The shoes have excellent shock absorbing properties and feel almost as light and comfortable as your regular running shoes. This makes them the perfect working shoes for projects that entail long working hours. The Sublite foam technology brings a significant reduction in the overall weight of the shoes while the tread pattern ensures that you won’t slip on wet or oily surfaces. The shoes also feature electrostatic charge dissipating materials meaning you are safe working around live electrical circuits. Materials used in the design are not waterproofed meaning the shoes are not suitable for working in wet environments. ☛ DON’T BUY before reading what users have said about these shoes on Amazon. Check it out here! Yes, it’s true. This unknown brand it’s a best seller on Amazon. And I guess I know the reason why! It’s less than 100 bucks! It looks good, it has safety features like puncture protection so you don’t have to worry about nails or broken glass on the floor. Safety toe cap, breathable mesh, rubber sole AND MORE are features that make this shoe a GREAT candidate for those of you who work a lot INDOORS! You should definitely check out the reviews section on Amazon for opinions. Click below! Most steel toe shoes have a reputation of only being suitable for use by male construction site workers. Well, times have changed and apart from female construction site workers, unisex working shoes have also entered the scene. The AiChuang Unisex steel toe work shoes are perhaps the sportiest looking work shoes I have seen thus far. The shoes are made out of high-quality material that is durable and applicable to numerous work sites. The shoes feature a soft comfortable inside and an abrasion-resistant breathable mesh vamp on the outside. This solves a common problem facing many machinists, site workers, and factory workers; sweaty feet often accompanied by odor. The shoes also feature a steel midsole insert that makes the shoes pierce-resistant while retaining a sleek profile. This AiChuang unisex steel toe work shoes are put through impact testing. The stainless-steel toe box can withstand impact from heavy items and retain shape keeping the wearer safe. They are ideal for most industrial and construction tasks. Puncture injuries are quite common and can disable even the most determined of workers. With this pair of shoes, you never have to worry about such injuries. The aesthetics on this pair of working shoes are absolutely fantastic. The design blends the looks of a high-performance sports shoe and the reliability, strength, and durability of working shoes. The addition of a steel midsole insert means that these shoes are flat and rather hard. You will need to get additional innersole inserts to boost the comfort levels. *Check out these awesome boots for people with flat feet in case you need even more additional comfort from your footwear. ☛ MAKE SURE to check out the reviews section of these shoes on Amazon BEFORE you buy! Work insole supported by the arch is ergonomic, which will make your foot more evenly stressed and feel more comfortable whilst at work or DIYing. The insole adds softness and breathability. It’s a very light shoe, perfect to work INDOORS. I don’t recommend you these shoes if you work mostly outdoors. They’re not waterproof but they do a good job for those of you lucky ones that work indoors. Read reviews on Amazon by clicking below! The Larnmern shoes are a brand of working shoes that combines casual aesthetics with durability and safety. The shoes look like your ordinary casual shoes with the only difference being the steel toe box that can withstand a drop force of 200 joules. The design is simple, aesthetically pleasing and quite comfortable to wear for extended periods of time. The use of breathable materials makes these working shoes even better. It reduces the occurrence of sweat accumulation and subsequent odor. There’s a lot of reasons why you might want to get this pair of steel toe shoes. The biggest of these is the fact that the midsole and innersole portions adapt to the natural contours of your feet providing maximum comfort even after hours of work. It has a dual density compression molded EVA that achieves ultra-lightweight cushioning and soft heel support. The arch-support footbed is designed to adapt to the natural contours of your feet and provide lasting cushioning and day-long comfort. The manufacturer markets this pair of work shoes as being great for construction and industrial work as well as outdoor trekking. It is one of the most versatile steel toe shoes currently on the market. These shoes are made from a non-marking rubber outer sole that is oil and slip resistant. It also features SRC wear resistance which means it’ll be a while before you notice any change on the outsole profile. The shoes are built to meet OSHA standards which means the steel toe box can withstand 200 joules of impact and hold 1000kg of resting mass. These working shoes lack a steel midsole insert which prevents any piercing injuries. This leaves you susceptible to a possible injury. ☛ PLEASE … before take any decision, read what almost 300 people are saying about these shoes on Amazon. This Cat shoe looks soooo nice 🙂 It’s PERFECT for the spring-summer season. If you are on your feet for many hours, you’ll love these work shoes. They’re not only VERY comfortable … but they are tough and long lasting as well! It doesn’t matter the industry you’re working on … these safety shoes seem to please a lot of people. See it for yourself on Amazon. Click on the button below to read reviews! If it wasn’t for the ‘steel toe work shoe” in its name, this pair of shoes would easily pass off as your regular casual low top shoes. The brand deviated from the normal hefty looking leather high top steel toe shoes and instead settled for a mundane look. That doesn’t however men there was any compromise on safety and comfort. The Caterpillar men’s Brode steel toe shoes are designed with the needs of a construction worker who needs a reliable pair of work shoes but prefers a sneaker with all of the safety and comfort features of a work boot. The shoes are made out of 100% high-quality leather with red stitching and a lace-up closure. The insole inserts ensure a comfortable work experience all day long. Due to the lightweight build, these shoes are a pleasure to walk and work in even in stressful extended periods of time. These Caterpillar safety shoes feature a waterproofed leather build that stands up to any stress or wears. The steel toe box is built tough to withstand 200 joules of impact force and 1000 kilograms of resting mass. The shoes also come with anti-slip treads that boost grip on all surfaces. This steel toe shoe features a simple yet quite comfortable design. Materials used in the build focus on providing maximum comfort and safety while retaining a hip, casual look. You can get off work early and hit the bar in these babies. 🙂 No need to change. The lightweight build on these shoes and the lack of a steel midsole puts you at risk of puncture injuries. For the most part, these shoes are waterproof except for the lace-up closure portion. Water or any other solvents you’re working with can easily permeate through there. A very comfortable and attractive shoe for you, Timberland fans out there. They’re a great choice if you work in an office, maybe in store, hospital, laboratory, even in the kitchen. Beside coziness, which is something we all want from our safety shoes, it has other great features as you would expect from Timberland. Check them out over to Amazon where you can read as well some reviews. Click Below! The Timberland PRO men’s steel toe Oxford is an all-around work shoe that features exquisite craftsmanship. The Gladstone ESD Oxford is defined by a neat array of features that not only offer comfort and unrivaled safety but also scores major points on aesthetics as well. Referred by most as a low top boot, this steel toe Oxford gets the job done. It has a hefty toe box complimented by thick soles, and a chunky profile, features that will improve your safety and comfort at the workplace. The shoes feature slip-resistant Goodyear rubber outer soles with proprietary SafeGrip technology that delivers superior traction on all types of surfaces. The Titan steel toe can handle an impact of up to 200 joules and carry up to 1000 kilograms of resting mass. The Timberland PRO shoe features anti-fatigue technology that makes use of polyurethane midsole inserts that ensure you stay as comfortable as you can be at the work site or wherever the job takes you. No slippage on either wet, dry or oily surfaces due to the low-profile tread pattern on the Goodyear rubber soles ensures. This can save you a great deal of trouble and injuries in high-risk environments. These shoes provide static dissipation protecting you from static buildup or discharge. These Timberland Pro steel toe shoes are a bit on the heavy side. They weigh a hefty two pounds which can make movement in these shoes a bit cumbersome. In summary, all the steel toe shoes discussed above score major points in the design, comfort, and most importantly safety. The Caterpillar steel toe shoes are built tough and can take on pretty much anything you throw at them. Reebok is a well-respected performance shoemaker and their entry on this list is well deserved. Timberland, Keen and LernMern similarly make impressive debuts on this list and I have nothing but praise for their superior quality work shoes. The number one most comfortable steel toe shoe title, in my opinion, goes to AiChuang unisex steel toe work shoes. The level of craftsmanship on these shoes is beyond extraordinary. The makers went above and beyond to make these work shoes unisex and achieve as much safety and comfort as is possible. They look pretty good too. Whatever choice of work shoes you settle for on this list, rest easy knowing they are the best of the best.